The multi-level parking facility of NAIA Terminal 3 is open. I have not been to T3 in a while and saw that the multi-level parking was operational only upon returning from a trip to Palawan last week. Last night, as I maneuvered to the open parking lot prior to fetching a friend at the airport, I was directed by airport security to the multi-level facility upon being informed that the open parking lot was already full. 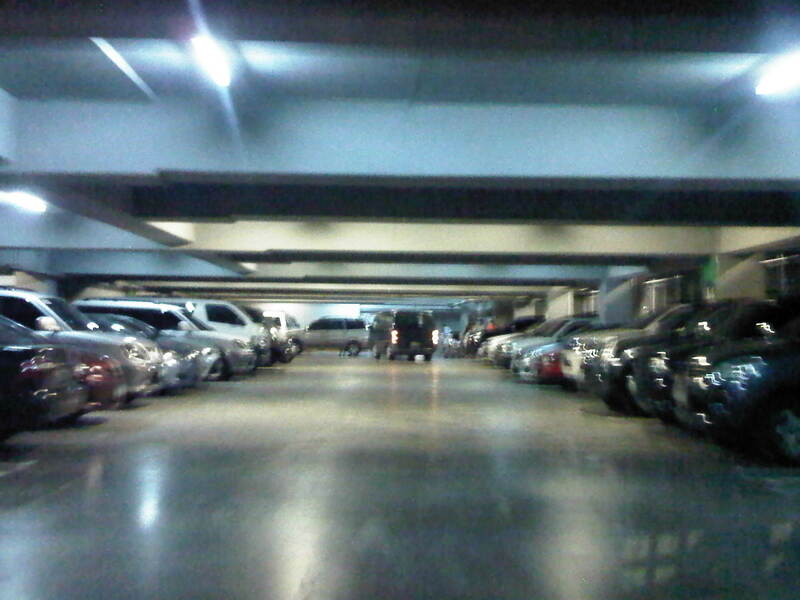 Following are a few photos of the multi-level parking at NAIA Terminal 3. The entrance and exit to the multi-level parking facility is at the end of the arrival level driveway. Motorists should keep to the right heading towards the parking building. There are two lanes clearly marked for the entrance. There are two booths but there is currently a desk where staff issue parking tickets to users. Driving inside the facility, one realises that it is spacious and could handle the vehicles generated by the additional flights begin served by T3. Not many people seem to be aware that the parking building is now operational based on the many spaces still available around the multi-level facility. Most people still use the open lot across from the terminal unless its closed off (full) and security staff direct them to the parking building. Most driveways are 2-way and so provides good traffic circulation inside the facility. The spaces nearest to the entrance to the terminal are obviously the first ones occupied. While it took some time for authorities to finally open the multi-level parking at T3, it is a most welcome development considering many international airlines have been transferring operations to T3. These include Cathay Pacific, Delta, Emirates, Japan Airlines and Singapore Airlines among others that will be using T3 as T1 is being rehabilitated. The rates are the same as the open lot (I paid PHP 40.oo for almost 3 hours parking.) and because your vehicle will be basically indoors, it is a good option for trips where you opt to leave your car at the airport (park & fly). NAIA charges PHP 200 per night but I think this is a very reasonable rate assuming that this is a more secure facility compared to the open lot. By d0ctrine in Airports, Parking on October 1, 2014 . It was 200 pesos last september, which to me was great as it was priced the same as the open lot. Perhaps they increased it? My next opportunity to check it out personally would be in the next two weeks when i go on a trip. so they allowed 4 days straight if i’m leaving for a vacation? Yes. You just have to pay the corresponding fee. I suggest that you park near the guards so that you’re assured (somehow) that someone would be looking after your vehicle. All NAIA terminals have no parking specifically for departures (para sa mga maghahatid sa paalis na pasahero). Mabuting ihatid muna ang aalis at mga maghahatid sa departure level ng terminal at mag-park na muna ang driver. Balikan na lang kayo kung gusto din nya makasama sa pagpapaalam. Masikip at walang upuan sa Terminal 1 kaya hindi kumportable ang pagpapaalam. Hindi pwede samahan sa check-in counter ang pasahero unless mayroon kayong prior na clearance na makukuha sa security (pero advance dapat). Sa Terminal 2 ganito din pero mas maluwag sa labas departure level kaya hindi siksikan. Sa Terminal 3 ay pwede kayong pumasok lahat sa check-in at maaari pa kayong kumain o mag-shopping sa terminal. Mag-park kayo sa multi-level parking na kadikit ng terminal para sama-sama kayo pagpasok sa terminal. Hi there. I read somewhere that they charge P200 for the first 24 hours plus a per hour rate for the succeeding hours. Is this true? Or do they charge P200 per night? Leaving for a 3 day trip and I plan to leave my car there for the duration of the trip. Thanks! They charged 200PhP per night but that was last September. Its the same rate as the open lot at the time. We are currently stuck here in the level 3(c) part. It is so chaotic! No one is managing the loading & unloading area. Hi! I’m travelling out of town with my family in a few days and need to know if we can park at the multi-level parking facility of Terminal 3, and then proceed to the departure area with our baggages? Or do i still need to drop off my family 1st at the departure area, then exit Terminal 3 to Andrews Ave. (making a U-Turn just before Villamor Air Base, then making another U-Turn at the Rotunda beside the Villamor Barangay Hall) and enter Terminal 3 again, but now from the lane for the Arrival Area in order to proceed to the multi-level parking facility? I have been doing the latter option several times in the past for Terminals 1, 2 & 3 and would like to know if the former option is now available for departing passengers. Thanks! You can proceed directly with your family to park at the multilevel parking. The entrance is at the end of the driveway at the arrival level (ground). There’s no need to exit the airport to make all those turns. They have a scanning machine at the entrances of the arrival and departure levels for those bringing their luggage. You should also be able to drop off your family at the departure level with their luggage and proceed directly to the multilevel parking, which has an entrance at the end of the driveway at that level but I am not sure that entrance is open. Last time I was there (a couple of months ago) it wasn’t open – thus the inconvenience of having to exit the airport and go around again just to park. For NAIA Terminal 3, the distance from the Departure Area to the Arrival Area (using the route described above) is approx. 2.7 kms., and depending on the time of day and season, this may take anywhere from 10 minutes to 30 minutes! Anyway, the obvious follow-up question would be: Upon our arrival at the airport (at the end of our vacation), will we be able to walk to the multi-level parking facility from the Arrival Area? Or will I need to again exit Terminal 3 and enter again (using the same route described above) to be able to “meet” my family (and baggages) at the Arrival Area Ramp? Thanks! I think its better to go for the departure or upper levels. There’s usually less vehicles at the upper levels of the parking building so you can get a slot closer to the entrance to the terminal. However, when you arrive you do have to make the extra effort to go up. Not really a big thing considering there are elevators at the terminal.